I love the simplicity of knots. One maxim my Scoutmaster taught me was that “a good knot is easy to tie and easy to untie.” I’ve tied my share of “bad” knots when I was a Boy Scout, but there are two knots that have stuck with me that I seem to use all the time: two half-hitches and the taut-line hitch. These knots are so versatile and easy to tie, it’s no wonder they are two of the foundation knots taught to all Boy Scouts. Using only these two knots, I can easily and quickly tie up a tarp for a hammock. One tip I learned was to create a “V” with the line so that the hammock suspension wouldn’t bang into the tarp. In this illustration, I show a continuous ridge line, but you can also use end-only tie-outs. TIP: For Hennessy Hammock users, disconnect the tarp from the hammock and tie it directly to the tree. You’ll see an immediate improvement in how tight the tarp is pitched. There are a few advantages of using a continuous ridge line. For tarps with a catenary-cut ridge line. you can get a much tighter pitch if the tarp is hung below the line. Tarps pitched OVER the ridge line benefit from additional structure and support during heavy downpours or snow falls. Once attached, the tarp can be easily and quickly centered between the anchors without requiring untying or unclipping hardware. Continuous ridge lines can make it easier to attach a tarp without having it touch the ground (hardware clips help in this case). About 30 ft (9 m) of line. I prefer braided mason line because it knots easily, has high visibility, is inexpensive, light, and has low bulk. As an added benefit, it doesn’t tangle easily when wound. Some people pack as much as 50 ft (15 m), but I find that 30 ft (9 m) is enough to span the distance between the anchor points (less than 14 feet, typically), plus the line to go around the tree and tie the knots. I could get away with less in most cases. (Zing-it and Lash-it are popular with hammock campers, but they don’t knot easily, so I don’t recommend them in this example). Simply tie one end of the line to Side A of the tarp ridge line tie-out using two half-hitches. Wrap the standing end around the tree and back to Side A and through the tie-out. Continue threading the line either OVER or UNDER the tarp to Side B of the tarp. Thread the standing end through Side B tie-out and around the other tree. Finish by tying a taut-line hitch to Side B. At this point you can adjust the tarp and center it left-to-right BEFORE YOU TIGHTEN THE LINE COMPLELY. This is an important step. Trying to slide the tarp back and forth with the line taut may saw into the bark of the tree. I’m not so strong at the knotology,but taken some ideas of this illustration to rig my new MacCat Ultra tarp for first time and this worked great! Creating V at the tarp ends avoided hammock suspension interference nicely. My first real wilderness hang in Latvia gone great! I’m glad this worked out for you! There have been a few times when I didn’t have enough cordage to create a “V”, but for the most part, it is the best way I’ve found to rig a hammock and tarp together. Thanks for visiting the site! thanks for this I am thinking I am going to have to replace the rope on my ENO Profly. All the inner rope is coming outside the inner rope. Will the mason line do the same? Is it easy to get knots out of it? Mason line is hollow core. In other words, there is no core to unravel. For heavy tarps, I would use something other than mason line for the ridge line. A lot of cottage retailers use Zing-it or Lash-it line made from Dyneema. I also use the mason line for side tie-outs on the tarp. The knots I often use with mason line include the taut-line hitch, two half hitches, bowline, and a single or double sheet bend. All of these tie well. The sheet bend is the most difficult to untie, but I also use this the least. I used a modified version of this last weekend when I accompanied a group of scouts on a 14 mile backpacking trip. The scoutmaster picked the site–and there were no trees I could have used successfully for my hammock. Forced to go to ground, I used the principles here to conveniently rig one end to a tree; the other end used a trekking pole to support and I was able to move it (unlike a tree!) to position it optimally. Using just step 1 in the illustration really simplified the process. Thanks for the tip! Fantastic! I’m glad it worked out. Although forced to the ground, the hammock is still versatile as a bivvy (just not as comfortable). Great job! Hey Derek, just discovered your blog and it’s looking great. Getting lots of ideas for me to use once I finally get all my hammock camping gear together. One thing I wanted to mention is I think your taught line hitch is actually a rolling hitch. A taught line hitch has two turns below and two above I believe. It’s possible that as with most knots, there’s lots of names that are used for all sorts of things though. Alex, welcome to the Ultimate Hang! I checked out the Rolling Hitch and it does have some visual similarities, but it ties more like a Clove Hitch than a Taut-line Hitch. What I have illustrated is the Taut-line Hitch: two wraps on the inside, one on the outside. Sometimes I’ll throw an extra wrap on the inside for better grip. Yes. Paracord is a true workhorse and a lot of people swear by it. However, 550 cord has two drawbacks: it stretches, and it holds water. There are lighter, less bulky, stronger options out there that don’t stretch or hold water, which are growing in popularity. A lot of people prefer the dyneema cord (Zing-it/Lash-it) for side tie-outs and ridge lines. BZ on the book/blog. Well done. Thanks Caleb! I love and use both the bowline and truckers hitch in the field. My guy lines are tied using bowlines. I think both are very viable and I think they are great. The truckers hitch is a better choice in many ways because you can get a tighter pitch. I see that you are often using braided mason line. Is this particular line a suitable for ridgeline and guy outs? I use mason line for guy outs, primarily. One drawback of mason’s line is that it is typically made from nylon, which stretches about 15-20% when wet. I also use guy line tarp tensioners that take up the slack in the night. Having it on a ridge line is harder to tension in this way, so I use a more durable line like Dyneema (1.75 mm Lash-it). What you’ve selected looks great! It’s higher quality than I’ve used and I don’t have any experience with it. The core may make it less stretchy. I’d give it a try, for sure. Let me know what you find out. Am I reading it wrongly? I use the mason line on the guy lines. This is because guy lines tend to get beat up and the mason line is cheap and high visibility. The ridgeline has much more strain on it so I recommend a higher tensile stength line. The 1.75 or 2 mm zing it line is great. I really like this style of rigging a tarp. The knots are easy, you still get a “nice V”, and there’s no added weight. I might suggest using the “slippery” versions of these knots to ease untying. Thanks Frode. There are a few ridgeline tension devices on the market that do just what you’re talking about. I find that corner tie outs with shock cord tensioners do a great job in picking up the slack. I use the Hennessey Hammock funnels and small plastic water bottles attached to keep the tension reasonable on my tarp and have water if it drizzles even a little. Ok, so first off, you have thoroughly convinced me that hammocking in the wilds of the beautiful world around us is THE way to go about communing with Gaia. Mostly because I love anything that can be accomplished with string. You say repeatedly that zing-it and lash-it are great for ridge lines, but don’t knot well and also that mason line and paracord isn’t because it stretches when wet. What is the best, knot taking, cordage that doesn’t hold water or stretch? I am not against gadgets and gizmos for tarp tensioning, but I like to hang without worrying about failures and knots do that better than my memory of how the gadgets work the right ways. There are so many cords that work I really couldn’t list them all. I do often use mason line because it does knot well and is cheap and high visibility. To account for the stretch, I add tarp tensioners, which is a good idea anyway, especially if you have a nylon tarp. 3mm accessory line is great, especially sheathed spectra. 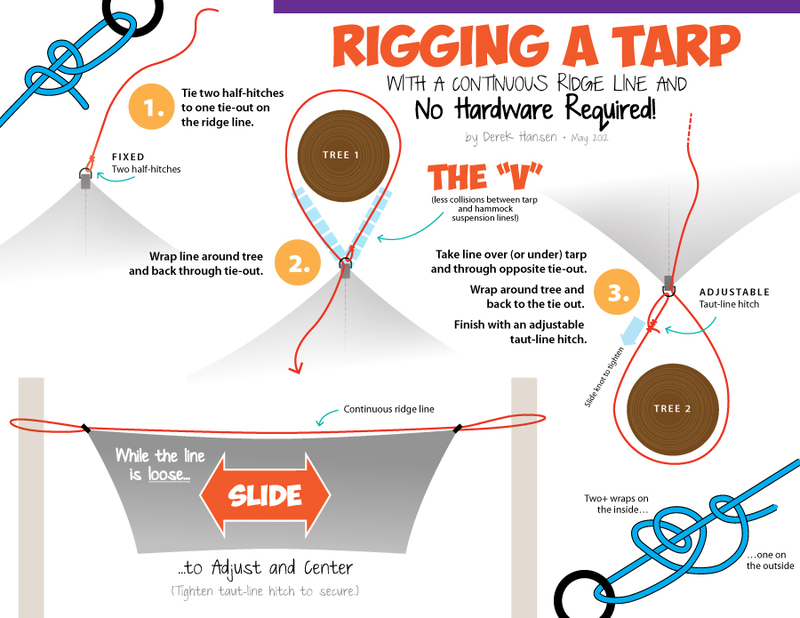 Your illustration on this page shows the tarp connecting below the hammock suspension which rises up through the V and attaches higher on the tree. That’s fine … until I use Dutch Clips for the suspension. Dutch is clear … you can’t center the hammock line. The Dutch Clip must be off-center which means the hammock ridge line is tangential to the tree. That in turn makes it rub against one side of the V.
This is probably OK; we’re not sailing so we don’t have to be all that careful about abrasion. But it seems wrong to me. What do you do? Do you attach the tarp above the suspension (as you did in THIS illustration http://theultimatehang.com/2012/06/rigging-a-tarp-with-dutch-hooks/)? Use some kind ofDutch Clip equivalent to put the tarp ridge off-center as well? p.s. : while your at it, does the open end of the Dutch Clip face up to the sky or down to the ground? I’ve seen both. In Dutch’s video, he has the opening face down. My intuition says it’s safer to face up … in case you didn’t hook the webbing as cleanly as you should. Does it even matter? p.p.s: Any tips on how to remember to take your hugger? The webbing is black and blends in with the tree, well above my usual eye line. I’m new to this hammock thing. As I’ve been practicing, I find that I forget a hugger about 50% of the time, catching myself only at the last moment when I do my camp site sweep (whew). Do you think different color webbing would help? Reflective paint strip? Or just wait for continual practice to seal the right moves into my bones? I use Dutch clips and I center them 🙂 actually, in practice, the clips will slide and center anyway. It’s not a big deal. I’ve missed straps before and had to hike back and retrieve them. Using bright colors helps. Or, Use a suspension system that is all attached like a cinch buckle, and you’ll always have them. I see you already answered some of these questions here (http://theultimatehang.com/2012/08/new-from-dutchware-dutch-clips-ti/). For ex., it doesn’t matter whether the opening faces up or down. Some but not all. In my experience, the webbing comes off tangential to the tree, not down the middle. That means it rubs the V. You were going to ask Dutch if it really HAS to go to the side … but I don’t see the answer. Thanks for a GREAT blog … and book. Great tips Derek. Thanks you. I have been hanging for 4yr.s and your advice has kept it all good.